A group of big banks tried to wreck a New Jersey trucking company during the 2007 credit crisis, the founder claims in a $300 million Manhattan federal lawsuit. The banks undervalued assets, charged outrageous fees and then threatened a credit cutoff that could have destroyed the business, the suit alleges. PNC and Wells Fargo, among other banks, concocted “an insidious scheme” to ruin the business, the lender liability lawsuit claims. The banks’ goal was to push Dana Transport of Avenel, NJ, into liquidation and then make a bundle in breakup fees, it is alleged. “The banks were using Dana Transport as a cash cow and then wanted to drive it into liquidation so they could take it over,” said Dana’s lawyer Brian Mahany. 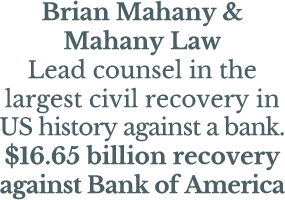 Dana Transport was victimized by predatory banks, which through forced mergers resulting from the financial crisis of 2008 wound up holding too much exposure to the company and wanted to get out, Mahany claims. Founder Ron Dana began the company in 1970 with a single truck. After 45 years and lots of hard work, it is now a $372 million company employing around 2,000 people, according to the complaint. In 2004, Dana starting using a $20 million credit line secured by company assets. He later increased it to $30 million. It helped him expand. The successful trucking company never missed a payment on the credit line, the lawsuit claims. Still, the banks said Dana lacked enough collateral. But the banks, according to the suit, were undervaluing assets. The lenders claimed that Dana Transport was technically in default in June 2007 during the economic downturn. Dana said that, until then, he had a good relationship with some dozen banks, which had helped the trucking firm as it expanded. But suddenly, Dana contended, the banks said its assets no longer had sufficient value to justify continued credit, which threatened its survival. A PNC bank spokesman said, “We never comment on pending litigation.” A spokesman for Wells Fargo also declined to comment on the litigation. Dana later found new bankers. His companies are doing well and didn’t lay anyone off, Mahany said. The complaint, filed in US District Court in Manhattan, contends the banks violated federal racketeering violations under the Racketeer Influenced and Corrupt Organizations statute.